This book provides an evocative snapshot of the cars and drivers competing in a memorable season of British motorsport. Detailing almost every major class and formula, including saloons and single-seaters, it sees the legendary drivers such as Stewart, Hill, Gurney, Brabham, Surtees and McLaren competing hard against the formidable talent of Team Lotus and works supported drivers Jimmy Clark, Mike Spence, Jack Sears, Sir John Whitmore, Pedro Rodriguez, Brian Hart, Peter Revson and Ray Parsons at the major UK race circuits. Copiously illustrated with nearly 200 hitherto unseen Black & White photographs from the Peter Darley Archive, this 208 page hardback book not only captures the unique atmosphere of the time, but also lists the race results for every class in which Jim Clark competed, recording the thrills and spills as they unfolded, for Colin Chapman’s record breaking Team Lotus in 1965. 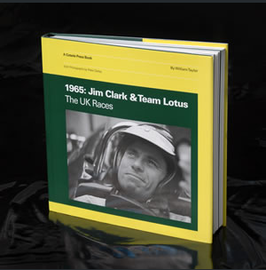 With contributions from Jack Sears who wrote the foreword, Sally Swart (Stokes), Bob Dance and David Hobbs, 1965: JIM CLARK & TEAM LOTUS-THE UK RACES is not just an invaluable record of Jimmy’s early life and times, but also a uniquely colourful depiction of an important period in British motor racing history. One which like many other Coterie publications is sure to become a coveted collectors item.